The bar at AQ. Photo from Facebook. A few cocktail-related pieces of news for you. First, we can all happily bid farewell to the nastily named Fluid Ultra Lounge in SoMa since it is going to be converted into ~NOVELA~, a new bar from Alex Smith (Gitane, Honor Bar) and Kate Bolton (Maven). 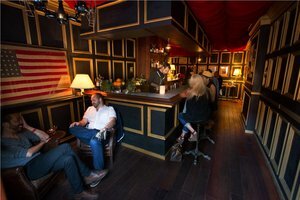 Eater mentions the honking space (3,500 square feet, seating for 120) “will focus on classic cocktails and an ambitious punch program, featuring punches made with traditional olio sacrum (freshly zested citrus oil) and served by the glass or bowl. 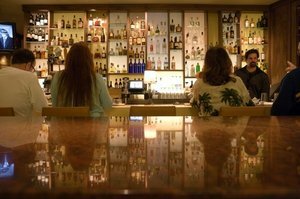 Though Smith and Bolton developed the drink program together, Smith will run the bar.” The look will be spiffy, with gilded ceilings, vintage books throughout the space, and Deco-inspired tiling. Look for an opening in three weeks or so. 662 Mission St. at Annie. 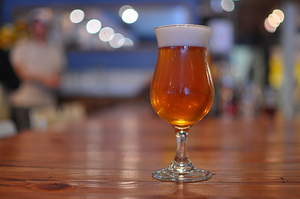 Over at ~AQ~, with the departure of Ethan Terry from behind the stick (stand by for news on where he’s headed and up to next), bar manager Timothy Zohn has brought on Jason Rager, previously head bartender from Holeman & Finch in Atlanta, which was on the short list for best bar program this year for The James Beard Foundation Awards. He just started on Sunday, swing on by and welcome him (and his adult beverage skills) to SF. Lastly, the new bar project that is opening in the former Marlena’s from Matt Conway, Anthony Healy-London, and Josh McAdam has a name: ~BRASS TACKS~. Stand by for updates on timing soon—for now, they just started reconsturction, and there’s a lot of dust going on. 488 Hayes St. at Octavia, 415-864-6672. The (very small) interior at Big. Photo from Facebook. Fans of ~BIG~ in the Tenderloin better swing by and say their goodbyes before June 15th: owner Jordan Langer is closing up shop as the hotel is becoming a Marriott, and he declined to stay on. Scoop says Big will reopen elsewhere but with a new name and team—Langer is going to work with bartender Brian Felley and partners Jeff Whitmore and Pete Glikshtern on a new space that is reportedly in mid-Market. 761 Post St. at Jones. Am sorry to hear ~ESTA NOCHE~ (oh, the stories in that place) is in trouble of closing if they don’t pay off the $9K they owe the city in license fees. Eater mentions there is an Indiegogo fundraiser, and if you donate $20, you can skip the line to attend their upcoming fundraiser party on Saturday May 18th (9pm to close, $10-$20 sliding scale). Any additional monies raised will be given to El/La (a trans-Latina nonprofit in the Mission). Help save this 16th Street queer institution! 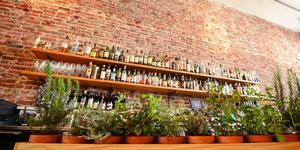 And 2013 marks the year our city won’t be hosting an installment of SF Cocktail Week. Eater’s interview with H. Joseph Ehrmann (Elixir, the Boothby Center) reveals a variety of reasons (like difficulties scheduling around the America’s Cup), but I heard some other rumblings about ABC and sponsorship issues. 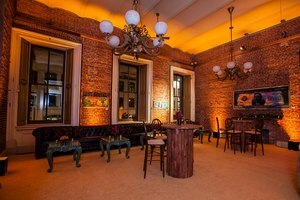 Anyway, it sounds like SF Cocktail Week is planning to come back in 2014, bigger and better. The bar at Fifth Floor. Photo by Justin Lewis via Facebook. Belly up for a $2 martini at LarkCreekSteak. Photo from Facebook. Start summer off thrifty and fabulous with some great wine deals around town. Check out ~BIG 4~, where every Sun-Tue in May you get 50 percent off bottles of wine on the wine list. You can also get half-off wine at ~GRAND CAFÉ~, where the entire wine list is half price for the month of May. Check out the wine list here, and look at all those bubbly choices. Pop! 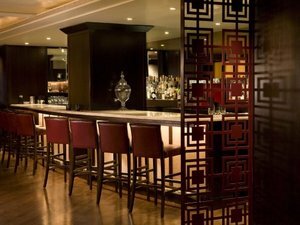 The bar at ~FIFTH FLOOR~ has a new happy hour going, with cocktail and drink specials from 5pm-7pm and food specials from 5:30pm-7pm, Mon-Fri. The drink list includes cocktails for $8 (check out that Pink Elephant with gin, pineapple gum, vermouth, orange bitters, and smoked absinthe), wine for $8, and beer for $5. There are also $1 oysters and other drink-friendly snaxx. Feeling a little 1965? Bring back the liquid lunch, and its prices, with a trip to ~LARKCREEKSTEAK~. Mon-Fri from 11:30am-2pm you can get their martini for a mere $2, made with either Stolichnaya vodka or Hendrick’s gin. The only part that isn’t very Mad Men? There’s a limit of two per person. Work it out. The interior at Piccino. Photo: © tablehopper.com. Check out these spiffy wine and sake dinners coming up soon. First, at ~PICCINO~ you can meet winemakers from the Alps at two different wine dinners. The first is on Wednesday May 22nd and features wines and makers from Cima Presanella in Italy. Then, on Wednesday June 19th, check out the wines of Dents du Midi from Switzerland. Each dinner includes four courses plus wine pairings, and costs $115 per person. Reservations can be made by calling the restaurant at 415-824-4224. Learn about sake and the process of making it at ~IZAKAYA YUZUKI~ on Monday May 20th. Niichiro Marumoto of Marumoto Brewery (makers of the Chikurin brand of sake) will be in attendance, talking about his process of sake brewing, and his rather unusual decision to grow his own rice for sake. The dinner includes five courses, paired with four different sakes, and costs $100 per person, not including tax and tip. 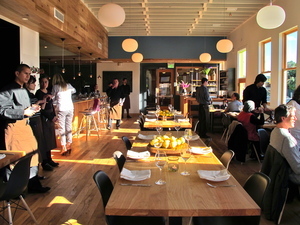 There are two seatings, one at 6:30pm and the other at 7:30pm, and reservations can be made by calling 415-556-9898.